Do you want to increase the festival atmosphere at home? Are you troubled about how to decorate your house? This LED light strip will solve your problem. Multicolor strip can show your characteristic by the wonderful light effect. This light strip will protect eyes, give you a better visual enjoyment, easy to install with back adhesive, wide application for decoration, DIY your colorful privacy space. TV backlight helps reduce the eye strain caused by long exposures to TV screens and monitors in dark rooms. Creates a comfortable bias lighting when watching TV or playing games, give you a better visual enjoyment. Easy to install with back adhesive, can be firmly attached to smooth, clean and dry surface. 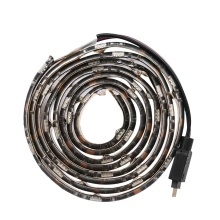 5V 5050 RGB LED backlight strip features low power consumption and extremely low heat, ensure use safety. Wide application, perfectly used for boutique lighting, stairs lighting, makeup mirror, wine cabinet decoration, Christmas, Halloween, festival lighting decoration, clubs, and other indoor decoration.